Get outside and get your hands dirty with two volunteer trips this month to the Oxford Organic Farm. 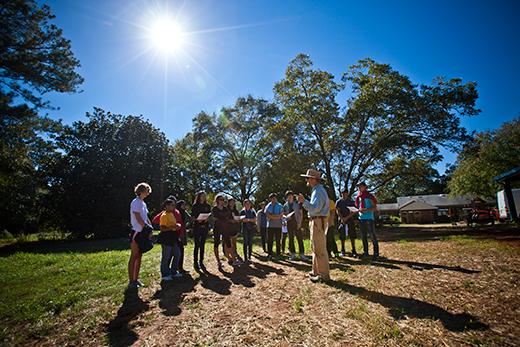 Participants will leave the Atlanta campus at 1 p.m. on Feb. 5 and Feb. 19 to travel to Oxford College, tour the farm and help farm manager Daniel Parson with a variety of tasks. February may be the shortest month of the year, but it is filled with entertaining and educational events at Emory. Founders Week, Emory's midwinter academic festival, continues through Feb. 6, and the Emory Events Calendar offers a full slate of options, ranging from academics to the arts. 1. Get your hands dirty at the Oxford Organic Farm. Sign up to join Volunteer Emory, Emory Dining and the Office of Sustainability Initiatives to volunteer at the organic farm on Emory's Oxford campus on either Friday, Feb. 5, or Friday, Feb. 19, from 1 to 5:30 p.m. Participants will leave the Atlanta campus at 1 p.m. to travel together to Oxford College, where you will tour the farm and then help Daniel Parson, farm manager, with various tasks before heading back to Atlanta around 4:30 p.m.
2. Kick off Super Bowl Sunday with the Bach Bowl. Before you watch the big game, don't miss virtuoso organist Timothy Albrecht’s annual Bach Bowl. This delightful one-hour concert presents a wide variety of Bach's music performed by the Vega Quartet, tenor Bradley Howard, pianists Elena Cholakova and William Ransom, and the Bach Bowl debut of Emory’s Don Saliers. The free concert kicks off Sunday, Feb. 7, at 4 p.m. in Emerson Hall at the Schwartz Center for the Performing Arts. 3. Enjoy concerts with Cupid, Emory faculty composers — or even in your pajamas! The Bach Bowl isn't the only opportunity to enjoy a free concert on campus this month, especially if you are a fan of classical music. On Friday, Feb. 12, fill your heart with Valentine's Day Love Songs, featuring tenor Bradley Howard and soprano Abigail Santos Villalobos performing with pianist Erika Tazawa. The Emory Chamber Music Society of Atlanta's John and Linda Cooke Noontime Series takes place in the Carlos Museum Reception Hall. On Wednesday, Feb. 17, the Emory Youth Symphony Orchestra performs a free concert at 8 p.m. in Emerson Concert Hall of the Schwartz Center for Performing Arts. The Emory Faculty Composers concert takes place Tuesday, Feb. 23, at 8 p.m. in Emerson Concert Hall, featuring works from Emory composers Richard Prior and John Anthony Lennon, with performances by Emory student ensembles. On Friday, Feb. 26, at 7:30 p.m., you can wear your PJs and bring a pillow for the Pajama Concert in the Carlos Museum Reception Hall, part of the Emory Chamber Music Society of Atlanta's Family Series. Along with great music, hot chocolate and marshmallows will be served. 4. Spice up your dance moves with free lessons from the Emory Salsa Club. Every Friday, "Dip into Salsa" with lessons offered by the Emory Salsa Club. No experience is required for these free lessons with professional instructors. Learn salsa from 6:35-7:35 p.m. and bachata from 7:45-8:45 p.m. in the 2nd floor multipurpose room of the Woodruff PE Center. 5. Bring the kids in your life to "Artful Stories" at the Michael C. Carlos Museum. The Carlos Museum offers events for the whole family, from children to adults. On Saturday, Feb. 20, kids can help celebrate the reopening of the museum's African Gallery with "Artful Stories," featuring a reading of Maya Angelou's "My Painted House, My Friendly Chicken and Me." Take a closer look at the intricate beadwork and geometric designs on the Ndebele aprons and then head downstairs to paint your own apron. Set for 10-11 a.m. in the African Gallery on level three of the museum, the program is free, but a reservation is required by calling 404-727-0519 or emailing avuley@emory.edu. 6. Take a free online class through Emory on Coursera. Emory offers a number of free classes that are open to everyone through the Coursera platform. Courses currently available on demand include "The Addicted Brain," "Ebola Virus Disease: An Evolving Epidemic," "Childbirth: A Global Perspective," and sessions on copyright for multimedia and specifically for educators and librarians. A new session of "From Freedom Rides to Ferguson: Narratives of Nonviolence in the American Civil Rights Movement," one of Emory's most recent Coursera offerings, begins Feb. 22 and runs through April 4. 7. Explore creativity with President Wagner. On Wednesday, Feb. 24, Emory President James Wagner joins in a Creativity Conversation with Rosemary Magee, director of the Stuart A. Rose Manuscript, Archives and Rare Book Library. They will discuss Wagner's inspiration for his own creativity as well as how he has tapped into those energies for his work in organization leadership. President of Emory since 2003, Wagner has announced that he will step down in August. He holds a bachelor’s degree in electrical engineering, a master’s degree in clinical engineering, and a PhD in materials science and engineering. He is a charter fellow of the National Academy of Inventors and a fellow in the American Academy of Arts and Sciences. The free conversation will take place at 4 p.m. in the Rose Library Teaching/Learning Studio on the 10th floor of Woodruff Library. 8. Play all day at the Student Activity and Academic Center. The pool won't reopen until April, but there is still plenty to do at the Student Activity and Academic Center (SAAC) on Emory's Clairmont Campus. Amenities include tennis courts, indoor courts for basketball, volleyball and badminton, plus plenty of fitness equipment. All students who pay the student activity fee have free access to the SAAC. Discount memberships are available for faculty and staff, or you can buy a one-day pass for $10 or 14 passes for $120. 9. Get inspired at TEDx Emory. TEDx events are local, independently organized conferences based on the TED theme of "Ideas Worth Spreading." Run entirely by student volunteers, the 2016 TEDx Emory will focus on the theme of "Beauty of Things Unseen," with a variety of speakers including undergraduate and graduate students. The Emory event has grown to 750 attendees since it was founded in 2011; registration is now open for this year's event, set for Saturday, Feb. 27, from 9:30 a.m. to 5 p.m. at the Woodruff Health Sciences Administration Building. Tickets are free for all Emory students. The price rises to $20 for Emory faculty and staff; while that is above the typical $10 limit for this column, you'll find it well worth it for a full day of inspiration. 10. Experience the poetry of Rita Dove. Rita Dove, U.S. poet laureate from 1993 to 1995 and winner of the 1987 Pulitzer Prize for poetry, will give a free reading on Sunday, Feb. 28, at 4 p.m. in Emerson Concert Hall of the Schwartz Center for Performing Arts. Part of the Raymond Danowski Reading Series, the event is free, with no tickets required. Dove received an honorary doctorate from Emory in 2013.